Ali Pretty is best known as the founding member and artistic director of the international outdoor arts company – Kinetika, which she founded in 1997 after a long established career in carnival arts and a growing commitment to community engagement work. Ali has collaborated with, and led teams of artists to deliver large-scale events to diverse audiences all over the world, such as; WOMAD (1985 – 1991), FIFA World Cup (2009), the London 2012 Olympic and Paralympic Games. 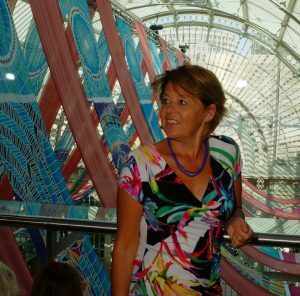 Her artistic direction and her hand-painted silk designs are renowned for their quality, both in their individual style as well as their ability to engage and leave lasting legacies in communities and individuals alike. In recent years Ali has been developing her practice as an artist in her own right. She creates transformational walking arts projects with diverse communities. 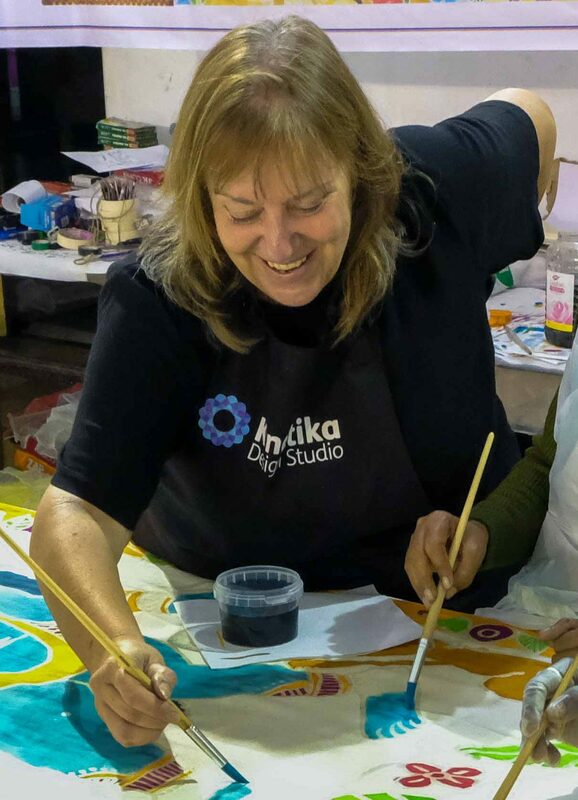 Through these projects Ali brings people together by walking, talking and painting large-scale silk creations. She created 12 large-scale silks for the Royal Opera House that hung in the ROH Paul Hamlyn Hall during the Deloitte Ignite 2015 Festival. Silk River will be an international development of the pioneering place-making model Ali has established since 2012, leading walking projects in Wiltshire, Isle of Wight, Lincolnshire, Essex and Thurrock, where she has delivered a two-year project (2015-17) entitled Thurrock 100. Ruchira Das, an arts manager, for over 15 years, has worked with several organisations across India. She was a participant at the Atelier for Young Festival Managers organised by EFA at Edinburgh in April 2014 and is currently a Fellow at ARThink South Asia 2015-16. She is also a Global Fellow at ISPA 2016. She was invited as a faculty member for Interim 2015 at Srishti School of Design, Bangalore. Her belief that an engagement with the arts is essential for a child to grow to be sensitive, imaginative, and creative and experience their world in a fuller manner, led to the genesis of Think Arts. In the last two years, along with several artists, Think Arts has created sensorial exhibitions for children, presented workshops & performances and curated several events that have innovatively engaged young audiences. Our History, Their Times, conceived by Ruchira, invited 35 senior school students in Kolkata to explore Calcutta’s history in the late 18th and early 19th century using the South Park Street Cemetery (a heritage site under ASI) as their focal point and creating artworks in response, which were exhibited at the Cemetery in Dec 2015. 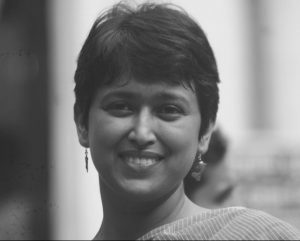 She has also created engagements for children in the Indian Museum, Kolkata and working on similar projects with other museums across India. 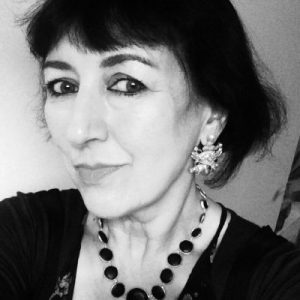 Jacqueline is a textile artist and educator, trained at University of the Arts, London and Anglia Polytechnic University, Essex. She specialises in Batik painting on silk, with the ‘Passing of Time’ being the focus of her most recent work. Jacqueline has collaborated with Kinetika since their move to Thurrock in 2014, initially as a volunteer but has since become a part of the team and is now the Lead Artist on the project Thurrock 100. Swarna was born into a family of six children and was married early. As a child, she took to painting by observing her father. She took a hiatus from painting after marriage. She again took up the brushes primarily to support her family. Sheer dedication yielded results and Swarna’s creations started getting recognised. She has participated at major festivals in France, Germany, Australia, USA, Sweden, China, London, and all over India to showcase her creations. Swarna paints on a diverse range of mediums: cloth, clay and ceramic. She has also deftly captured the changing times; improvising from traditional stories, today, she depicts the Tsunami and terrorist attacks of 9/11 in her art. Social themes like AIDs, child marriage, and child trafficking have also found place in her creations. Swarna specialises in painting on issues related to women’s empowerment. She has painted on themes like female infanticide, trafficking of girls, etc. She now is a role model for the girls of Naya, braving their way through years of subjugation, poverty and gender discrimination and achieving new heights through their artistic skills resulting in empowerment and safeguarding of their heritage. 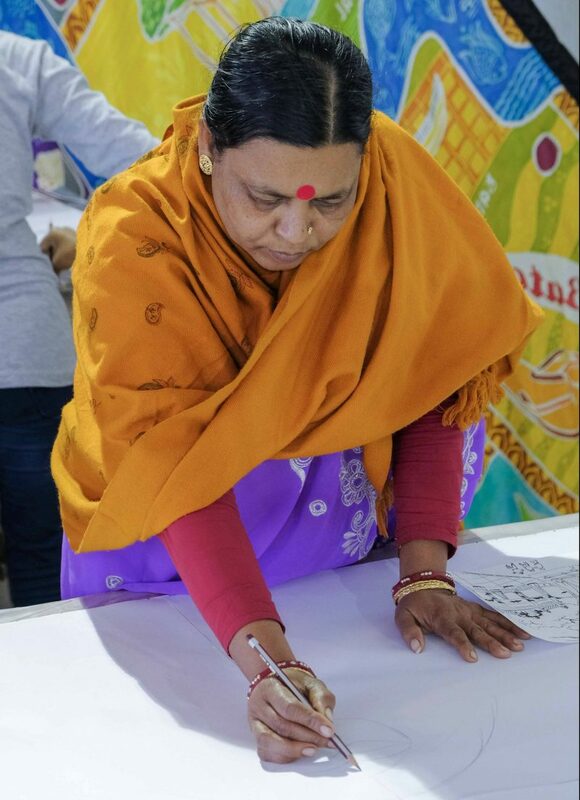 Monu now 44, has been painting since the age of 15. He loves to address social issues through his works. Monu has travelled all across India and to Sweden and Paris. A team of twenty craftspeople will be selected to attend and create the ten scroll depicting the stories of the ten communities, alongside twenty contemporary artists and arts students. Elizabeth creates and collaborates on work that is engaging, challenging and gets people talking, thinking and feeling. She works with artists and communities, organisations and individuals. She has led creative organisations that place young people and communities’ involvement at the heart of their vision, including Roundhouse Studios 2001-8. As a producer, researcher and consultant recent work includes projects for Wellcome Trust, Oily Cart Theatre, Bush Theatre, The Poetry Society, Creative Barking & Dagenham and Home Slough. Elizabeth is an Associate Research Fellow in Contemporary Theatre at Birkbeck University. Whilst Director of A-Team Arts in Tower Hamlets 1982-96, Elizabeth collaborated with Indian artists at the Aditi Festival at the Barbican and London International Festival of Theatre, both in 1982. This led to a research visit to India in 1983 during which she was spontaneously invited to direct a workshop production with Habib Tanvir in Raipur, ‘Mechka Hasis Ga’. Subsequently the British Council and Arts Council awarded her funding to direct productions at the invitations of Naya Theatre (Jadukar Kalukar, Raipur, India1985), Ajoka Theatre (Threepenny Opera, Lahore, Pakistan 1990, and to research theatre in Bangladesh (Dhaka and Sylhet,1985). It was during the 1985 project in Raipur that Elizabeth met Ali Pretty who joined the project as a volunteer. After the production they both travelled with Naya Theatre, a Pandavani party and a troupe of Chhattisgarhi Panthi dancers to Kolkata. Here they met more Indian artists and were exposed to Jatra and the arts of the Patua storytellers, amongst others. You can read more about this HERE. Silk River is close to her heart. The legacies arising from the work with Naya theatre include far-reaching influences on her approach to collaborative working with people and communities, international partnerships and life-long professional relationships and friendships such as Ali Pretty. Korak is a writer and director for film and theatre. In 1989 Korak moved from Kolkata to the UK where he worked in a wide range of roles on diverse projects, including making films. Now he has returned to India to pursue a full-time career in film and television. He recently completed feature length film, Thik Dupure (57 mins) which was screened in a many international film festivals. 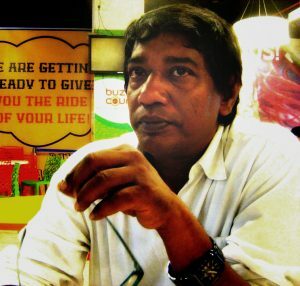 In 2016 he was commissioned to make a short film Bouquet From Bengal and Streets of Kolkata soundscape for Silk River partner, Royal Botanic Gardens, Kew as part of their Orchid 2017 festival – a colourful celebration of India’s vibrant plants and culture, which were exhibited at the Princess of Wales Conservatory from 4 February – 5 March 2017. Korak has also made a series of promotional short films for Kinetika on Silk River. 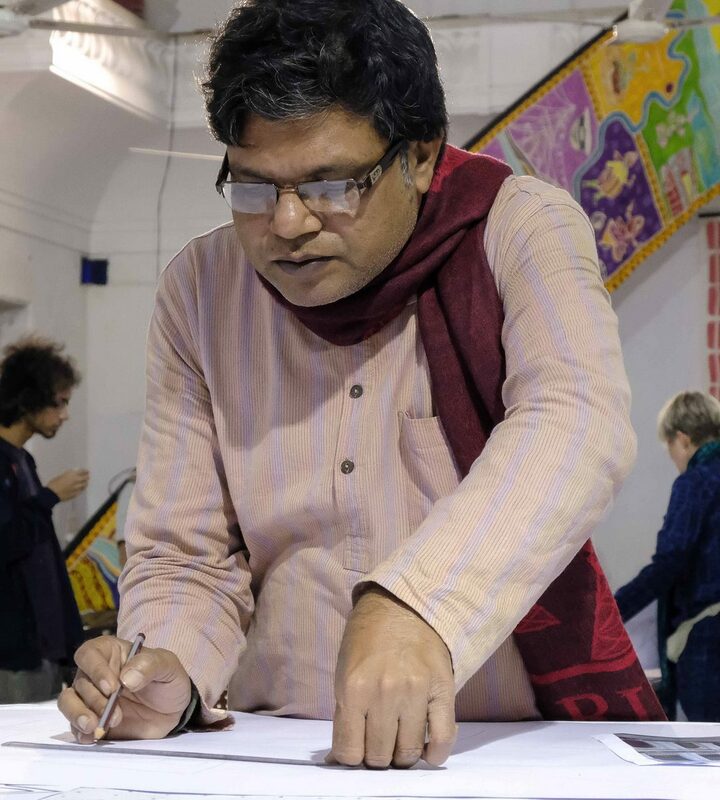 For the last three years he has been making a feature length documentary film on the River Hooghly in and around Kolkata, writing scripts for a TV serial in Bengali for Kolkata based TV channels and his feature film script Bandh has been selected by key producers in Mumbai. In the UK, between 1989-2010 Korak worked managing urban renewal and regeneration projects and led the Creative Enterprise Network in East London. Korak has extensive experience in directing theatre productions in London, including productions in the Bloomsbury Theatre in the West End, and for WOMAD in Nantes (France), Toronto (Canada) and London International Festival Of Theatre (LIFT). Korak worked with Kinetika on Din Shuru their Indian Carnival project in 2003, and Tiger Out East in 2006. 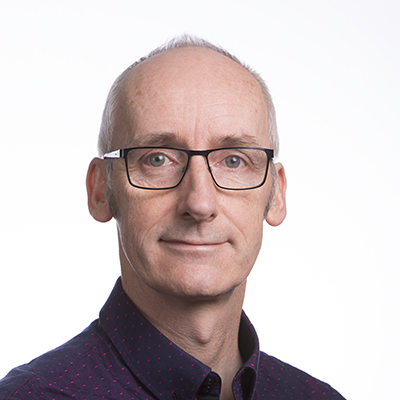 Kevin Rushby is Guardian Travel’s ‘Explorer’ and a contributor to the Saturday Review. 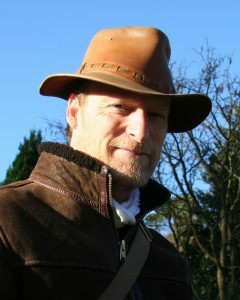 He is the author of four acclaimed travel books, including Hunting Pirate Heaven, an investigation of 17th century pirate utopias in the Indian Ocean. His most recent book is Paradise, a historical account of human searching for perfection over the centuries. His film ‘Saving the Arabian Leopard’ won the Best Foreign Documentary at New York Wildlife Film Fest and also Washington Film Festival.